This month's sun and rain have brought the flowers out to bloom and inspired you for this month's Love Cake theme. With flower flavours, decorations and tins there's something for everyone even if you don't have green fingers! So let's take a look at what you have been baking this month. Caroline at Caroline Makes... had a full book of recipes to choose from with a copy of Cooking with Flowers. She decided to make for her Mum's birthday a Cardamom Layer Cake with Raspberry and Rose Mascarpone. A lovely summery cake with fresh rose petals. Ros from The more than occasional baker was worried that her Lemon Drizzle Cake with Lemon Glaze wouldn't fit this month's Love Cake brief. Take a look at it though – it's a lovely petal shape. A zingy lemon cake gives fresh taste this tin deserves. I've never been much cop at cake decorating and have a particular hate-hate relationship with my piping bag. Kate at Gluten Free Alchemist seems to have no problem with hers. 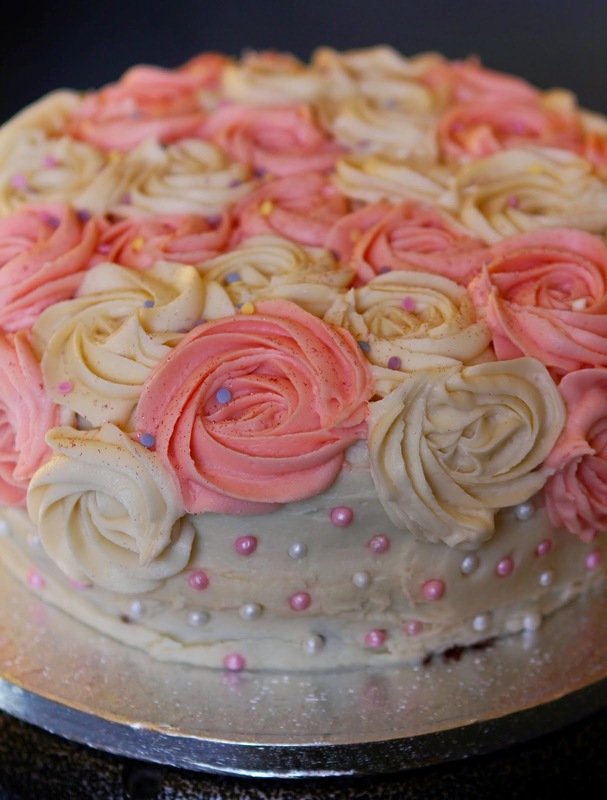 Beautiful rose buttercream piping covers a Gluten Free Chocolate Cake which has been made for a special occasion. Each year Kate makes birthday cake for her daughter's friend which means her own daughter is able to tuck in as well. It's also been made to highlight Coeliac Awareness Week which this year is focusing on guaranteeing that a basic range of gluten free items is available at all times in supermarkets. From one gluten free cake we go to another in the form of Linzi from Lancashire Food and her Blood orange, lemon and almond cake. 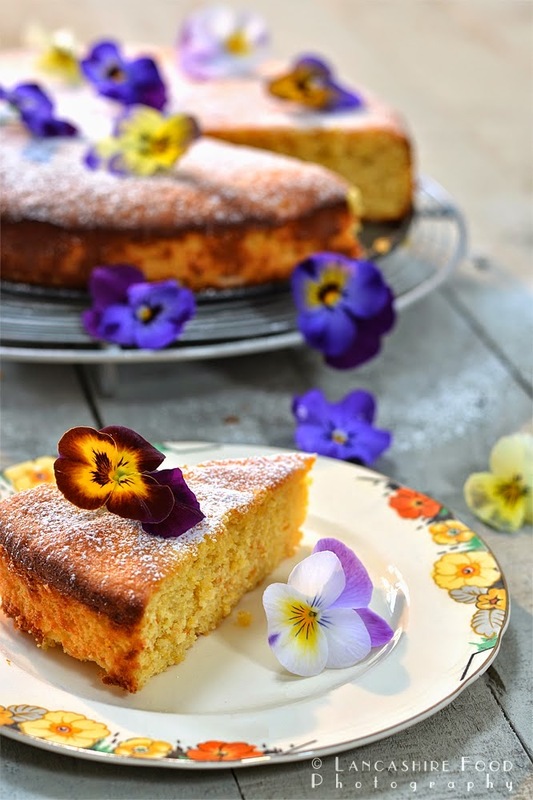 I have a particular love of these sort of naturally gluten free cakes because I love almonds and I think citrus fruits work so well and gives such a zing. Linzi has given hers the flower treatment with a decoration of fresh violas in various colours. Over at Fromage Homage there's been some serious elderflower inspiration. Pans of cordial are steeping but in the meantime there's Elderflower Cheesecake to be made. This recipe has gone mad on my Twitter account in the past few days and I can see why. 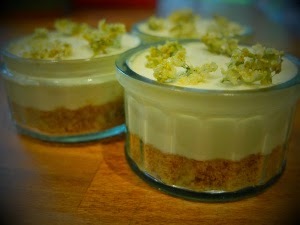 The elderflower flavouring gives it a great twist along with the ginger and digestive biscuit base. There's a certain buzz about Konditor and Cook about at the moment. I think they must be a new book out as I've read several recipes and articles about them recently. They're not new company but not one that everyone has heard of. Caroline of Caroline Makes... has certainly been a fan for some time and in particular their recipe for Lemon Chiffon Cake. A tried and tested recipe Caroline chose this bake for this year's Mother's Day cake. A decoration of sugar flowers topped it off. To put my piping skills to further shame Ros at The more than ocassional baker made a Chocolate and Mint Giant Cupcake and managed to keep the fantastic roses on the cake without them slipping off! The classic combination of chocolate and mint and of course the green colour to go with it was inspired by the opening her local MacMillan Information Centre. It's awards season in the bloggersphere and quite rightly Elizabeth at Elizabeth's Kitchen Diary has been nominated for a 'Brilliance in Blogging' award in the Food Category. To celebrate this she decided to make a cake as obviously there is no finer way to mark such good news. A root through her freezer uncovered a stash of rhubarb and a spy along her spice rack picked the delicate crocus stigmas that is saffron. These all came together as Rhubarb and Saffron Yogurt Cake. I finished off the month with a taste of late spring. With the elderflowers blooming I decided to make a Lemon and elderflower cake. 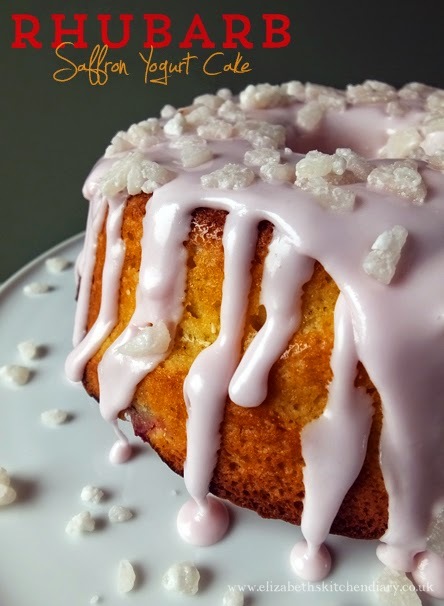 The cake is flavoured with lemon zest and is then topped with a crunchy elderflower drizzle. Many thanks to everyone who linked up this month and your selection of flowers in flavours, shape and decoration. There will be a cake break for a couple of days before I reveal the theme for June's Love Cake. Amazing set of recipes! Mouthwateringly good looking cakes. There are loads of great flavour combinations and ideas here... I will definitely be trying some of these...... Thanks. What a heavenly floral round up! So many delicious cakes!